Happy Tuesday! I am so excited today because Honeyville has graciously invited me to do another guest post on their blog and I get to share another delicious recipe with you. Because it's my absolute favorite almond flour to bake with, of course I said YES! Their almond flour has truly helped make my wheat and grain-free transition so much more enjoyable and easier to maintain long term (for almost 2 years now) and because of that, I never feel deprived. It's consistent high quality and freshness produces some of the best baked goods I have ever eaten. I'm constantly experimenting and creating new recipes and the recipe that I created for my 2nd Honeyville guest post is near and dear to my heart. One of my most favorite old recipes was for a sour cream coffee cake with cinnamon, sugar, and walnut streusel. I didn't think I'd be able to enjoy anything like that again after going grain-free, but low and behold, I even surprised myself (with the help of Honeyville, of course)! 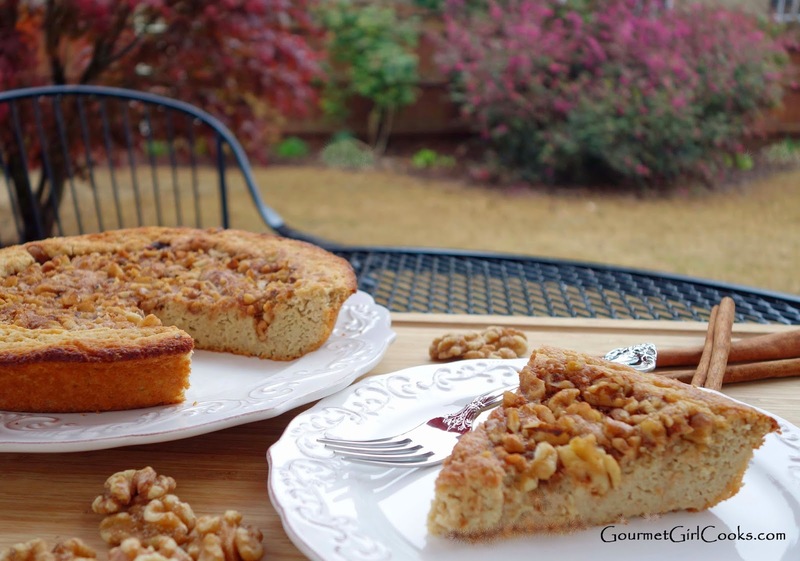 I've created a grain-free version of that coffee cake that is also sugar-free thanks to my favorite sweetener, Swerve. The super fine grind of Honeyville's blanched almond flour helps to recreate a texture that is almost identical to that of my old recipe. This cake turned out moist, dense, rich and delicious, just like the original version. This coffee cake goes absolutely perfect with a cup of coffee and it makes a great breakfast, snack or dessert, too. 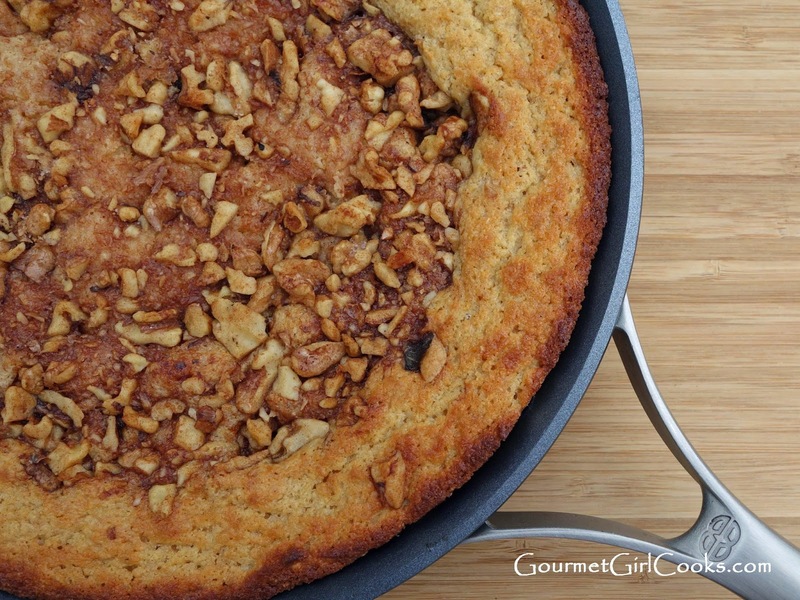 The recipe is super simple and it is baked in an ovenproof skillet! This coffee cake would make a perfect addition to your Easter breakfast table and is something that everyone (grain-free or not) will enjoy. It will most definitely be found on my Easter breakfast table this year! I have enjoyed using Honeyville's blanched almond flour for close to 2 years now and haven't found anything else that comes close to its quality. To check out my Skillet Sour Cream Coffee Cake and get to the recipe, please click on this link: Skillet Sour Cream Coffee Cake. I'll be making another one later this week! Take a sneak peek below. Enjoy! I am allergic to flax seed, can this be left out or does it need a substitute? I love your blog, great recipes!!!! Hi GG--what a great recipe! I've pinned it and look forward to making the coffee cake for Easter Sunday. What a wonderful honor for you to provide a recipe for Honeyville Almond Flour. It's the only almond flour I use. LOVE the look of this recipe, yum!!! A couple of questions (I hope that's OK)--what could I use for a purely "crumb" topping instead of the nuts and butter and cinnamon? I love cinnamon and was just thinking it would be yummy as a crumb topping (I love nuts but not so much in a sweet setting, hopefully that will change). Another idea is to have a glaze, what would you suggest as a recipe, I'd love to emphasize the maple or cinnamon! Or both! Where do you buy the maple flavoring? In some recipes in "Wheat Belly", a sugarless maple syrup is there and I have no idea how to find such a product--any suggestions? Last (sorry for all the questions, I appreciate your assistance), I've been told that powdered inulin can be substituted for powdered sugar? Have you used this or do you use something else, and what do you use? Thanks again, I love your recipes. I'd love to see a lemon cake with a glaze topping sometime, lemon is one of my all-time favorite flavors--yum!!! I cannot wait to try this sour cream coffee cake!!! I posted on Honeyville before I made the cake. Now I've made it. It's a winner! My husband and daughter loved it. So my husband says, "Oh yes, this will be nice for me to have EVERY morning with my coffee before I go to work." I will take that as a hint that I need to keep one always prepared. Thank you again GGC. We appreciate you. Hi Joanne! I'm copying the response I posted back to some of your questions on Honeyville's blog: For a crumb topping, I would use a dough blender and cut in a mixture of blanched almond flour, butter, cinnamon and sweetener and then scatter it on top of the coffee cake (sort of a cinnamon butter crumb topping). I have 2 types of natural maple flavoring (one is by OliveNation and the other by Boyajian and available on Amazon (here is my affiliate link for you to see what it looks like: http://www.amazon.com/gp/product/B002BUCSUC?ie=UTF8&creativeASIN=B002BUCSUC&tag=gougircoo-20) The Boyajian brand has more intense maple flavor. I tried this as soon as I saw it! It is really good/ better than you said. We loved it. Thank you for all the time and patience it takes to make a recipe work. I know we really appreciate it. We had overnight guests last night which necessitated a late departure for work this morning so that I could provide breakfast. Since today also happens to be my birthday, I wanted to ensure that my birthday breakfast would be special - even if I had to make it myself and cook for a bunch of extra people! I decided to make this sour cream coffee cake! Am I glad I did - Happy Birthday to me!!! It was so good. My husband (who usually isn't a fan of sharing my Gluten Free fare) thought it was delicious as well. My guests also thought it was delicious. Thank you so much for all of your incredible recipes. Keep up the good work, and know that you are definitely providing an invaluable resource to a lot of people! I made it in my 10" cast iron skillet. I don't use this pan as much as my little 8" but was able to remove the coffee cake with little fuss by running a thin flexible spatula underneath it (after cutting a couple of wedges out first.) A little layer did stick a bit to the bottom, but not too bad. I need to make a point of using my 10" more frequently so that it can develop a nice non-stick surface like my 8" is getting. This is delicious. I made it for Easter morning. I will be making this often. It's so moist and full of good cinnamon taste.